Chorizo is the lure. 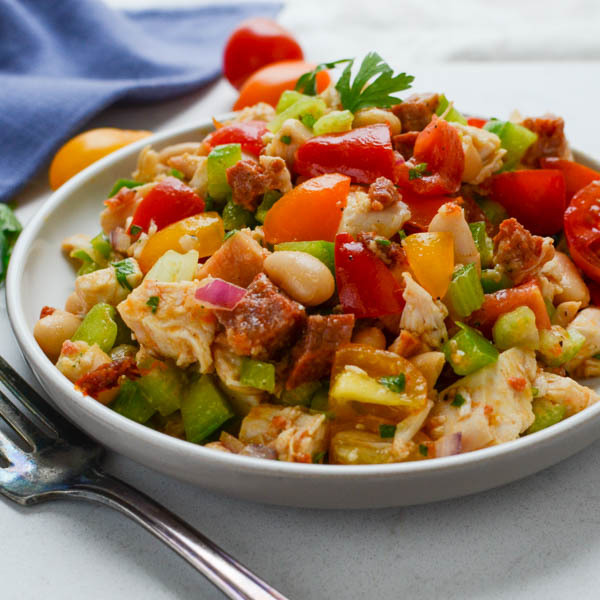 Savory chunks scattered throughout the mix and also in the dressing! It’s meat²! Before I get ahead of myself, let’s start with the chicken. 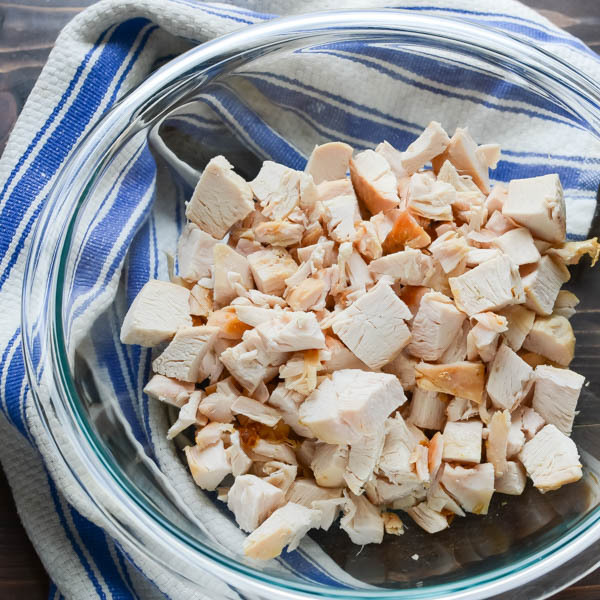 I used chicken breast from a rotisserie chicken (they’re so ridiculously convenient, you know?) Remove the skin and dice it into bite sized chunks. 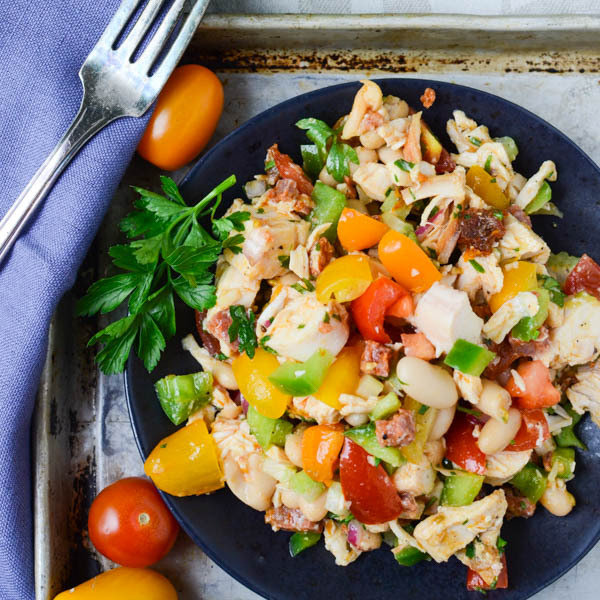 Now for the “salad” portion of our dish — diced bell pepper, celery, ripe tomatoes and a can of rinsed and drained white kidney beans. The beans (also called cannelini) are creamy, dense and play beautifully with the other flavors. Red onion adds heat and sun-dried tomatoes are sweet and chewy. 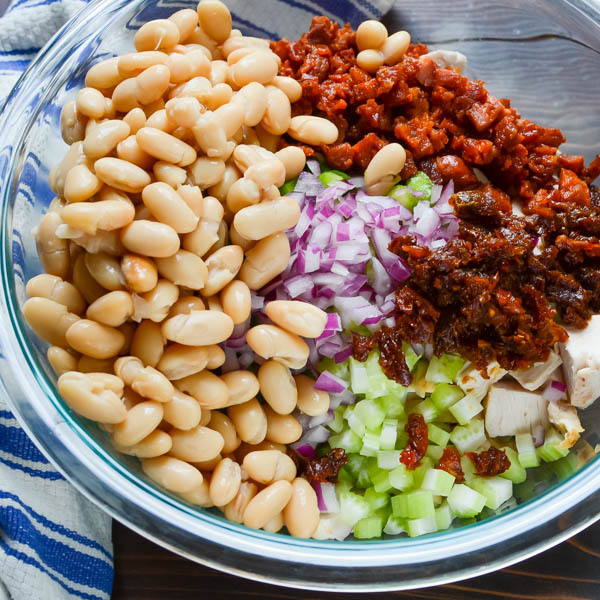 The chorizo dressing gives the whole salad a smoky, tangy flavor. You only need 1 tablespoon of the reserved oil from the cooked chorizo in the vinaigrette to flavor the whole dish without overpowering it. 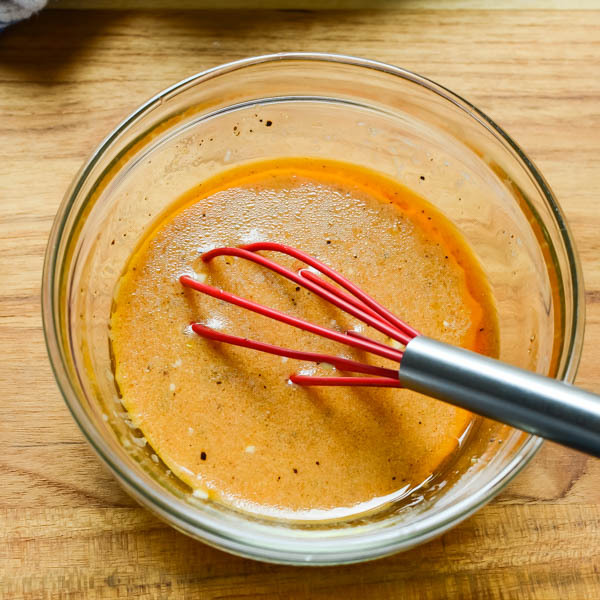 Whisk the vinaigrette until emulsified and drizzle it over the salad fixins! Toss to coat and serve. 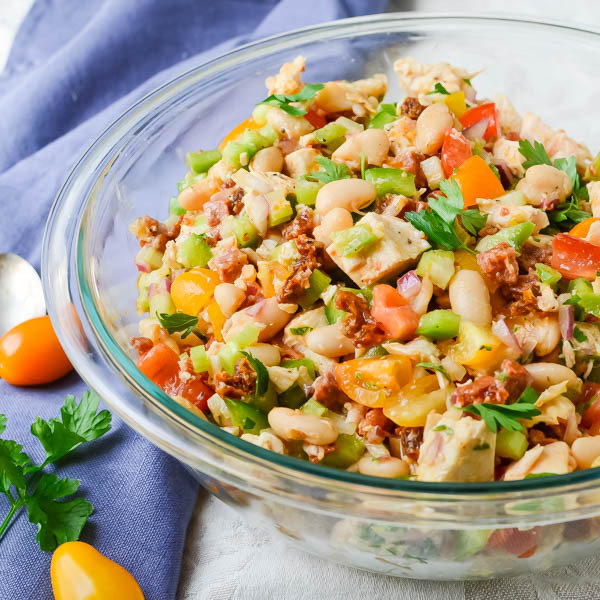 This savory salad can be served at room temperature or chilled. It’s perfect for al fresco dining and holds up in the fridge for several days, making Smoky Chorizo Chicken Salad ideal for brown-bagging during the week! This salad has heft. 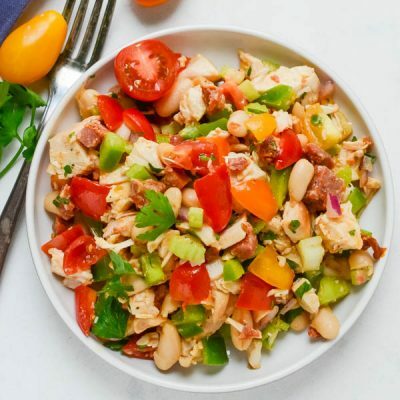 It’s meaty, filling and not what you’re expecting when someone mentions “salad” and if you like chicken salad, be sure to try Curried Rotisserie Chicken Salad, Lemon-Scented Chicken Farro Salad and Loaded Chicken Salad. This is the salad that eats like a meal! 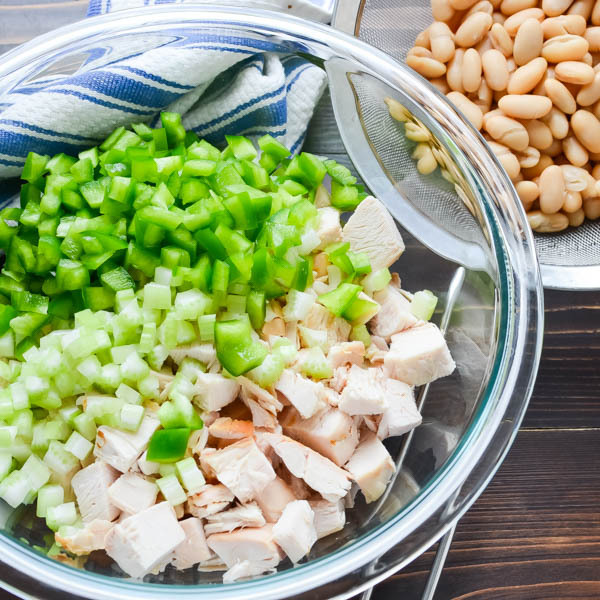 Use diced rotisserie chicken breast to simplify prep, this meal is ready in 20 minutes and keeps well for a dynamite brown bag option! Place a nonstick skillet over medium high heat and add diced chorizo. Cook until chorizo renders its fat and is fragrant and crispy. Use a slotted spoon to transfer chorizo to a dish lined with paper towels. 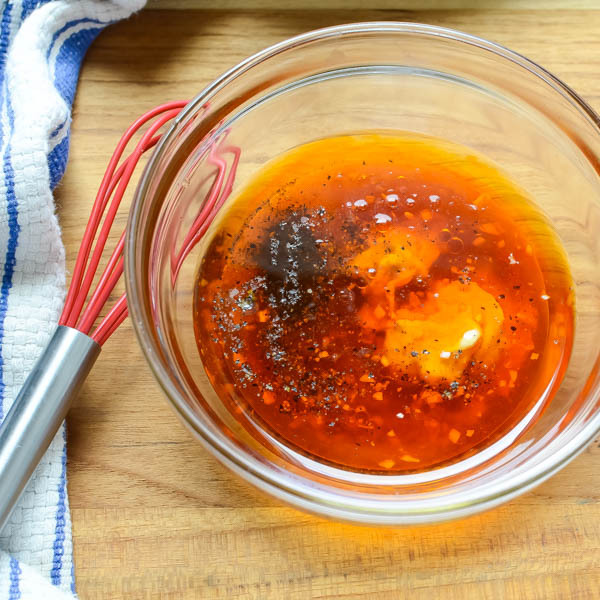 Reserve 1 tablespoon of rendered oil in the pan for the dressing. 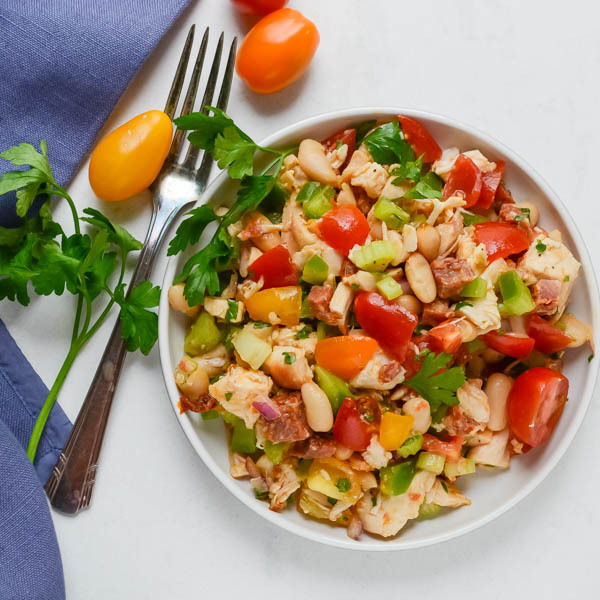 In a large bowl, combine the diced chicken, celery, onion, bell pepper, cannellini beans, sun-dried tomatoes, cooked chorizo and parsley. Set aside. 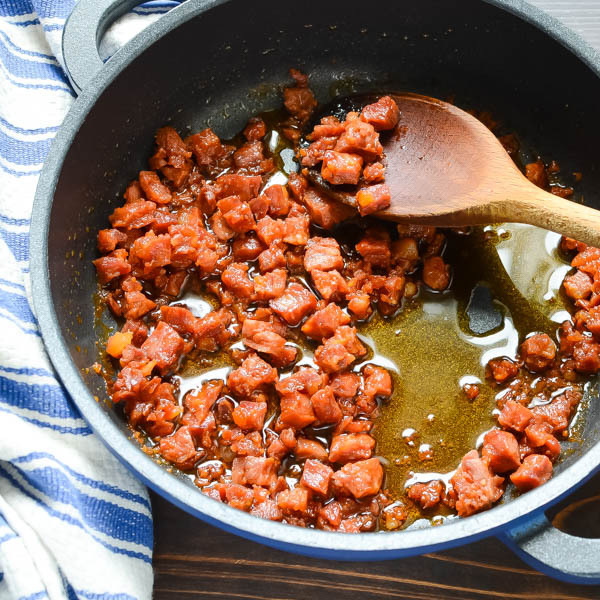 In a small bowl, whisk together the garlic, dijon, chorizo oil, olive oil, red wine vinegar, salt and pepper until emulsified. Pour the dressing over the salad and toss until well combined. I can definitely see this as a man salad! Even my husband would be on board. Such beautiful photos and I love that you incorporated beans too. Totally hearty and a beautiful dish! I think I’ve found my true love! The colors! The flavors! The sauce! The chicken! This would be a perfect meal for me … I’d eat it daily. This batch didn’t last in our house! Looks like a really healthy lunch to day on a daily basis…count me in! I must be a man, I love the spicy chorizo, great idea to put same of this spicy oil in the vinaigrette. I think I have a little of the “guy” gene too! I absolutely love chorizo but it’s so hard to find in Italy. 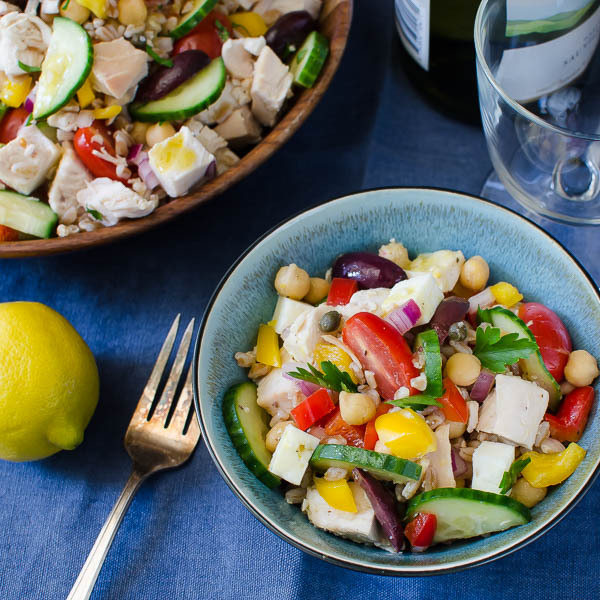 This salad is just packed full of delicious flavours and I can tell it would just taste fantastic! Chorizo has such a smoky, spicy flavor — I can’t get enough.